The employees of Accace Hungary have already proved their professionalism towards their job, but this time, they have showed their passion towards sports and their environment with their outstanding performances. István Nemecz – Managing Director of Accace Hungary, Péter Licska – Senior Accountant, and Norbert Pintér – junior tax consultant have completed the 21 km distance of the 33rd WizzAir Budapest Half-marathon on 9th September. 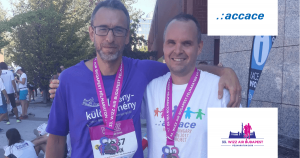 Besides the great sport performance, the Managing Director of Accace Hungary has set a noble goal to reach, namely to support a Foundation of sick children with every meter he runs. The target goal of collecting 200,000 HUF to donate was successfully reached before the race, thus the individual record of István (1:45:01, which has won him the 1162nd place out of the 11.000 runners) meant donating 9.61 HUF with every meter he covered. Norbert Pintér, junior tax consultant of Accace Hungary, completed the distance in 2:15:05, while Péter Licska, senior accountant, who joined the Accace Team, crossed the finish line as 153rd out of the 700 participating teams. In the name of the colleagues of Accace, we congratulate on this achivement and thank you for the support in the name of the Foundation that will use the donated money to support the experience therapies of sick children!